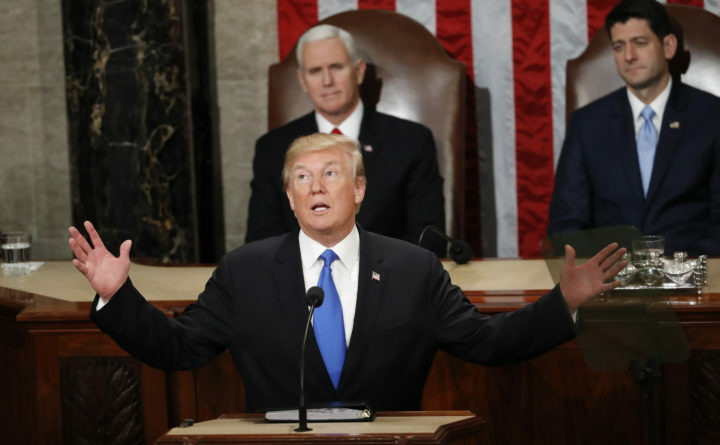 In this Jan. 30, 2018, file photo, President Donald Trump delivers his State of the Union address to a joint session of Congress on Capitol Hill in Washington. Maybe. Or we could just call it “hardball.” Pelosi was applying legitimately held power in pursuit of a policy goal. In this case, the goal was reopening the government and withholding $5.7 billion toward a wall that, Democrats believe, would serve little purpose beyond helping Trump fulfill an impulsive, ill-advised campaign promise to the minority of Americans who think the wall is a good idea. Whether hardball or theater, Pelosi had legitimate reasons for disinviting the president. I’m not sure how much the security of the address would be compromised during a shutdown, but clearly it’s not fair to ask people who are already working without pay to work even harder in order to support an event that is entirely unnecessary. And why a speech? Throughout most of our history the constitutional requirement for a presidential report “from time to time” to Congress on the state of the union has been met in written form. In fact, I suspect that our earliest presidents would have been appalled — perhaps disgusted — by the spectacle of the modern State of the Union address, in which both houses of Congress, the Supreme Court and the heads of the military assemble annually to inadvertently exalt and celebrate a single citizen whose main job is to execute the laws passed and vetted by the other two branches of government. The pomp. The ceremony. The cheering. The extended standing ovations. Talk about political theater. George Washington would shake his head and wonder what has become of us. As it happens, this would be a particularly good year to dispense with the SOTU address or to render the constitutionally required report in writing. All presidents assert that the state of the union is “strong.” This year it’s a bigger stretch than usual to call the SOTU strong, but we can be assured that Trump will do so, despite the fact that by the end of the month there is a decent chance that part of the government will still be shut down. In fact, it wouldn’t be hard to write Trump’s speech for him. If he holds true to form, the SOTU will be the strongest it’s ever been in our entire history, and he’s likely to take credit for it. He will assert that the economy is booming and unemployment is low, especially among blacks and Hispanics. He will argue that America is finally getting the respect it deserves in the world, that he has forced our NATO allies to meet their defense obligations, that we are winning the trade war with China and that North Korea is on the brink of denuclearization. Trump is unlikely to mention, however, climate change, which is the true national emergency. Nor will he mention the weakening of international institutions that have helped stabilize the world since World War II. Nor will he mention the increasing impunity enjoyed by autocratic, strong-man governments. He’s unlikely to mention the weakening of the American middle class, the retreat from our commitment to provide health care for all citizens or our deteriorating infrastructure. He will brag about his biggest accomplishment of the past two years, the tax cut for those at the top of the income scale, but he’s unlikely to mention the $1.5 trillion deficit induced by the cut. In short, a Trump SOTU address would be predictable to the point of irrelevance. Much of what he would say would be deceptive or untrue, but the very setting in an august chamber of Congress before the assembled powers of our nation would tend to give his language a kind of credence that it doesn’t deserve. I suspect that there will be a speech; Trump probably won’t be able to resist. Parts of the speech will be wrong, parts will be misleading and parts will blame other people. None of it is likely to enhance the state of our nation. John M. Crisp, an OpEd columnist for Tribune News Service, lives in Georgetown, Texas.